Annagry, Co. Donegal in sleeps 6 people. Lake and Mountain Views. This spacious house is set amongst stunning scenery, beside a babbling mountain stream, which flows into a lake at the bottom of the garden. Cosily furnished and equipped with two open fires, the house has views across the lake to the mountain. In the lake you can fish or boat or just enjoy the peace and quiet the area affords. A Blue Flag surfing beach is just 2 miles away, whilst walking direct from the door can be thoroughly enjoyed with the stunning local scenery and abundance of wildlife. This accommodation makes a superb holiday base throughout the year. Shop, pub and restaurant 0.5 miles. All on ground floor: Living room. Dining room/kitchen. 3 bedrooms: 2 double, 1 twin. Bathroom with bath, shower cubicle and toilet. Open fires in living room and dining room/kitchen (fuel included). Oil central heating, electric, bed linen and towels included. Microwave. Washing machine. Enclosed lawned garden. Parking (2 cars). Holidays at Annagry, Co. Donegal run from Saturday to Saturday. For a better idea of where Annagry, Co. Donegal is, you can see Annagry, Co. Donegal on the map below. 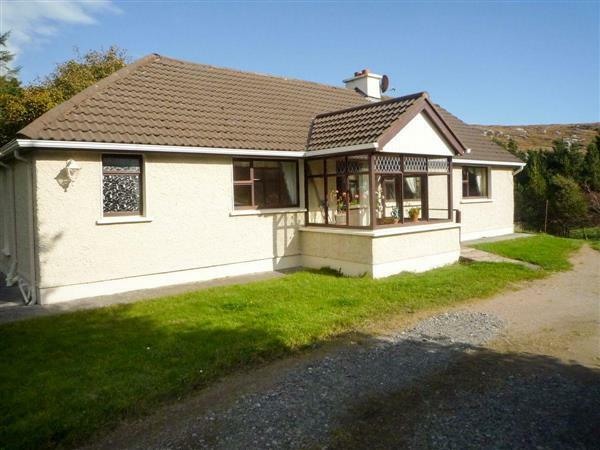 Do you want to holiday near Annagry, Co. Donegal (W5902), you can see other cottages within 25 miles of Annagry, Co. Donegal; have a look to find your perfect holiday location.